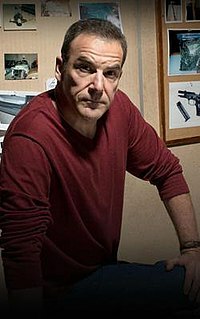 Jason Gideon was a fictional character in the CBS crime drama Criminal Minds, portrayed by Mandy Patinkin. Gideon was a Senior Supervisory Special Agent and the unit chief of the FBI's Behavioral Analysis Unit, and has appeared from the series' pilot episode "Extreme Aggressor", which was originally broadcast on September 22, 2005. He is also portrayed as a younger man by Ben Savage, in flashbacks. Mandy Patinkin abruptly left the show in 2007, just as his character abruptly quit from the BAU, due to emotional distress. In 2012, Patinkin opened up about why he left stating that the show "was very destructive to my soul and my personality. After that, I didn't think I would get to work in television again." Immediately after Gideon's departure, Hotchner was appointed unit chief. When Hotchner (played by Thomas Gibson) also departs the show, the position is given to Prentiss then very temporarily to someone until Prentiss becomes chief, and still remains so currently. In season ten, Gideon was murdered off-screen by Donnie Mallick. While investigating the case of Adrian Bale, a.k.a. "The Boston Shrapnel Bomber", Gideon had reportedly suffered a nervous breakdown after he sent six men into a warehouse before Bale detonated a bomb inside. All six agents and a hostage were killed, and he was heavily criticized about the event. He took a six-month medical leave because he was suffering from post-traumatic stress disorder. Upon his return from medical leave, he was given the Senior Agent position, as Hotch was confirmed as Unit Chief. Not much is known about his personal life, other than he has a son named Stephen, with whom he was estranged because of his commitment to his job. Through the first two seasons, Gideon was portrayed to be very good at chess, winning against Agent Spencer Reid many times (only exception being Reid's birthdayE104) and encouraging him to "think outside the box." Prior to the series, he was said to have had a "nervous breakdown" (or "major depressive episode") after he sent six agents into a warehouse with a bomb in it; all six agents and a hostage were killed, and he was heavily criticized about the event. He showed particular dislike for the practice of using religion as a defense or motivation for one's crimes. Gideon participated in some field operations during his time with the BAU and had the rest of his team "think outside the box" as well, as he made a major advancement by shouting at the top of his lungs with pleas of mercy and, when questioned by his team, he said that the victims were being threatened to be kept quiet as neighbors would have heard the pleas if they were unrestrained. He blamed himself for the torture Reid received from Tobias Hankel as he had ordered Penelope Garcia to add a virus warning to the videos Hankel posted. He also blamed himself for the reason Agent Elle Greenaway was shot. Gideon also had a son named Stephen.E111 The nature of their relationship has not been directly stated, but it was implied that they have not seen each other very recently. Gideon also has an obsession for birds and bird-watching. The character of Jason Gideon was partially based on real-life criminal profiler John E. Douglas, one of the founders of modern Behavioral Science. He helped Derek Morgan and Spencer Reid through their nightmares. He was shown to have a very close relationship with Reid, having hand-picked him from the FBI Academy for his team, helping Reid through many difficulties and even leaving the good-bye letter for Reid to find. Gideon knew Garcia very well. In the show's first episode, "Extreme Aggressor", Gideon was called back to work to help profile a killer, called "The Seattle Strangler" by the media, who abducts women and holds them prisoner before strangling them and dumping their bodies. After solving the case of the Seattle Strangler, Gideon is seen at an old-fashioned gas station in Dumfries, Virginia. While inside, Gideon notices that the cashier fits his profile of the Footpath Killer, a serial killer he had been investigating prior to being called in for the Seattle Strangler case. The man notices Gideon's gun and threatens him with a shotgun, insisting that he tell him who he is. When Gideon reveals he is with the FBI, the gunman gets even more agitated. Gideon then tells the man that he can tell him the one thing no one has ever been able to tell him: why he stutters. However, Gideon did not truly know the answer but was merely trying to provoke a stutter in order to distract the killer. The killer forced Gideon down a hall and into a small room full of pictures of his many victims, an amount that was more than law enforcement had found. Gideon intentionally demeans and insults the killer, increasingly agitating him and making his stutter worse. He takes his eyes off Gideon just long enough for him to grab the gun and subdue the killer. In "Won't Get Fooled Again", a copycat bomber uses the methods of serial bomber Adrian Bale (the same criminal who committed the warehouse bombing that killed his six colleagues), and Gideon has to face his past and Bale, to find out who the bomber is and stop him. After saving the lives of more agents from a suicide bombing, Gideon was forced to make a deal with Bale to have him help them get a bomb off of an innocent man. When Gideon realizes that Bale is lying about how dismantle it, he calls his bluff, saving them all from a bomb going off. He then has the pleasure of returning Bale to prison, the burden of the six agents' deaths presumably gone, even mocking him while he was being placed in a cell by using Bale's own words ("[A]n emotional release") in a sentence; he states that he finds it an emotional release in putting away criminals like Bale. In "No Way Out", Gideon faces the scariest and most evil serial killer in his entire career, Frank Breitkopf (Keith Carradine). The BAU had received a call from Georgia Davis, the Sheriff of the Golconda, Nevada Sheriff's Department, who had recently found two murder victims, both missing their right rib bones, similar to a case that took place in 1996. However, Gideon realized that this unsub has been killing for thirty years. After studying one of the murder victims, he determined that the unsub has extensive medical knowledge, his victims are alive when he cut off their limbs, and that he uses Ketamine to immobilize his victims. With this information, Gideon and the team were able to build a profile of the killer. In order to find the unsub, the Sheriff's Department set up a road-block looking for an RV, truck, or trailer, which was believed was the killer's mode of transportation. Gideon later noticed that something was bothering Sheriff Davis, and she told him that the profile the BAU gave them reminded her of the experience made by a local named Jane Hanratty, a.k.a. Crazy Jane. Jane had encountered the unsub thirty years ago when her car broke down, but she believed that an alien had abducted her; she survived the abduction. Gideon knew that the unsub allowed Jane to survive because she wasn't scared of him. Eventually, Gideon discovered Frank in Fat Sam's Diner and Deputy Silo told Gideon he had fifteen minutes to negotiate with the unsub. Frank tells them that he had left the schoolchildren in the middle of a desert, and that if he gets Jane, he will tell them where they are. Gideon makes a deal with Frank: he and Jane will come with him if he takes them to where the children are. Frank happily agrees to that. After they pick up Jane and deliver her to Frank, Gideon drives the two to the desert and drops them off, to which Frank tells Gideon where the children are. Frank and Jane then walk off while Gideon runs in the opposite way and finds the children, all unharmed. Gideon and Hotch try to follow Frank's tracks, but they suddenly disappear in the desert. In "No Way Out II: The Evilution of Frank", while Gideon is trying to make up his mind about what flowers to buy his friend, Sarah Jacobs, he sees Jane. When he looks up again, she has disappeared. Gideon then receives a call from Frank, who is in Gideon's apartment, having murdered Sarah. He demands to have Jane back before hanging up. When the BAU begin to investigate, Gideon contacts Hotch from a payphone and tells him that Frank dumped something in the trash on the street, later revealed to be bloody clothing. During the investigation, it is deduced that Frank is hunting down people Gideon previously rescued. Frank later kills one such person, Rebecca Bryant, who was abducted by Randall Garner and held captive for two years before being rescued by the BAU. Later, Tracy Belle, the sole survivor of Jeffrey Charles, goes missing. Gideon and Garcia are later able to figure out that the only story that moved Frank the first time Gideon met him was the body of a woman who was found in an apartment on the Upper East Side of New York City because he was talking about his mother. Gideon then realizes that Frank was hiding his mother's existence from everyone. Later, the team manages to find Frank, who is calmly sitting on a bench at the Union Train Station, waiting for them to bring him Jane. The team brings in Jane, who refuses to go with Frank. Gideon shows up and tells Frank about Sarah, Frank's mother, whom Gideon claims was a whore. As Gideon and Hotch describe Frank's mother, JJ and Reid locate Tracy, who is bound and gagged but alive and unharmed. Frank convinces Jane to come back to him, and the two commit suicide. Later, Tracy calls Gideon and thanks him for saving her once again. Gideon began to lose confidence in his profiling skills after Frank Breitkopf murdered his girlfriend, Sarah Jacobs. During his final case in Arizona ("Doubt", season 3), he further lost faith in his abilities when his decision to release the unsub resulted in the deaths of both the unsub and a young woman. As a result of his actions, Aaron Hotchner was suspended, which was the final straw for Gideon. At the end of the following episode, "In Name and Blood", Reid visited Gideon's cabin but found only his gun and badge, along with a letter meant for Reid in which Gideon explained his desire to regain his belief in happy endings. Gideon was last seen entering a Nevada diner; asked by a waitress where he was going, he replied that he did not know his destination or how he would know when he had reached it. He then left the diner and drove off, as his voiceover off-screen narrated the final lines of his letter (also marking his very final words), "I guess I'm just looking for it again. For the belief I had back in college. The belief I had when I first met Sarah and it all seemed so right. The belief in happy endings." In the Season 10 episode "Nelson's Sparrow", Gideon was murdered off-screen, having been shot dead at a close range by a serial killer named Donnie Mallick (Arye Gross), which prompts the BAU team to investigate Gideon's murder. During the flashbacks focusing on a young version of him for the episode which show him working at the BAU in 1978, he is played by Ben Savage. ^ Gennis, Sadie (September 15, 2012). "Mandy Patinkin Regrets Criminal Minds: It Was Destructive to My Soul". Thought Co. Retrieved May 13, 2017. ^ "5 CBS Sync Facts from Nelson's Sparrow Criminal Minds S10 E13". Archived from the original on 10 March 2015. Retrieved 29 January 2015.